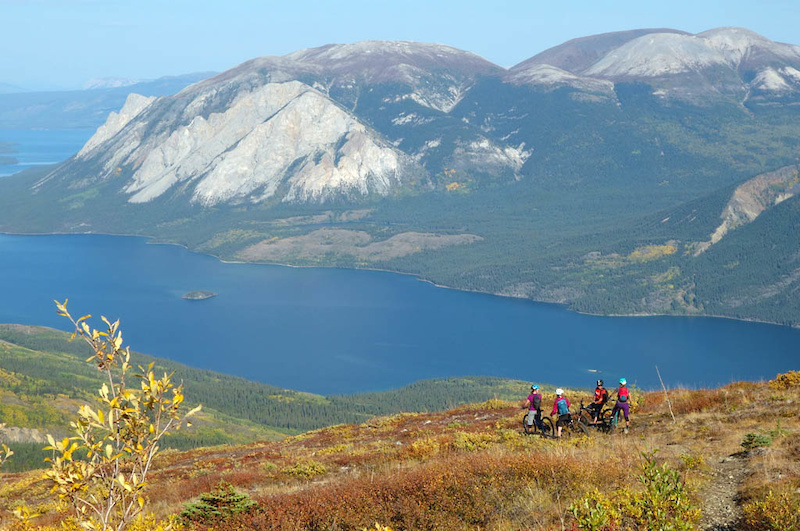 Carcross is a tiny town located in the southern Yukon, about 40 minutes from the Yukon population center of Whitehorse. Established in 1898 as Caribou Crossing by the gold miners who had reached the junction point of the Tagish and Bennett lakes on their way to the Klondike gold fields at Dawson. 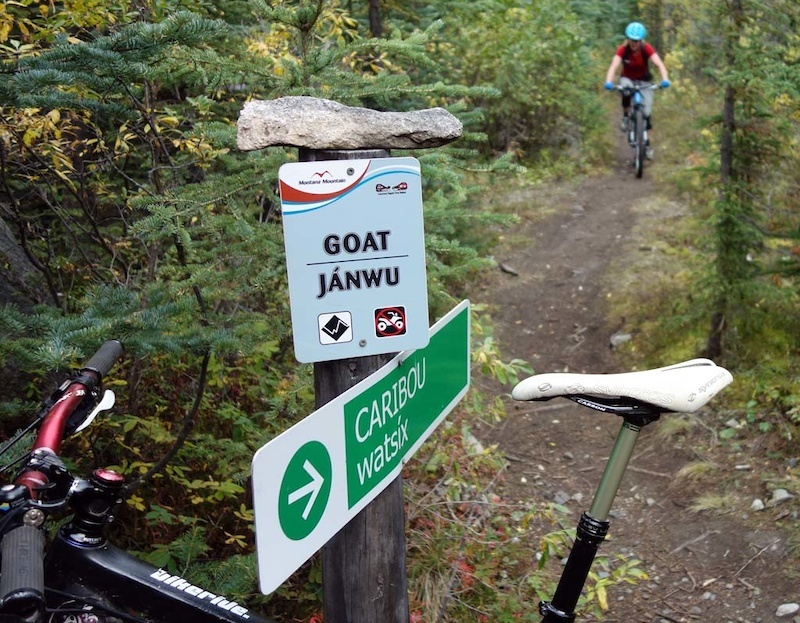 The town has since been renamed Carcross to distinguish it from another “Caribou Crossing” in British Columbia. Silver was mined in this area in the 1900s, and thanks to those miners, we have roads leading up Montana Mountain. Going even farther back, the Tlingit and Tagish people have hunted in this area for 4,500 years. 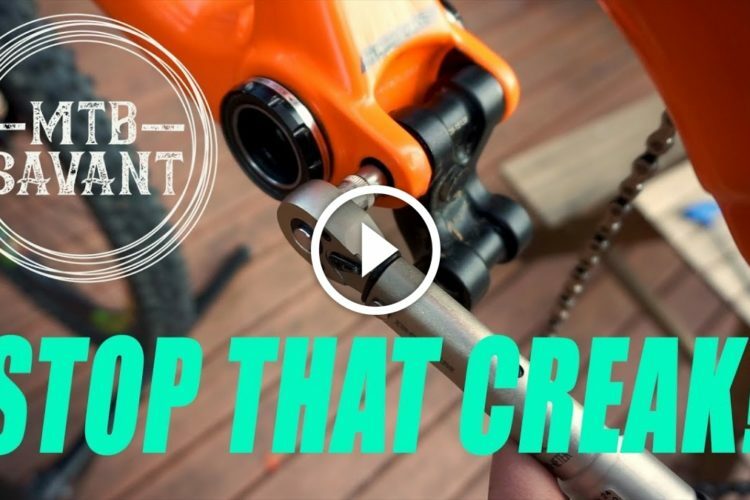 We can thank them for some of the mountain bike trails we now ride. 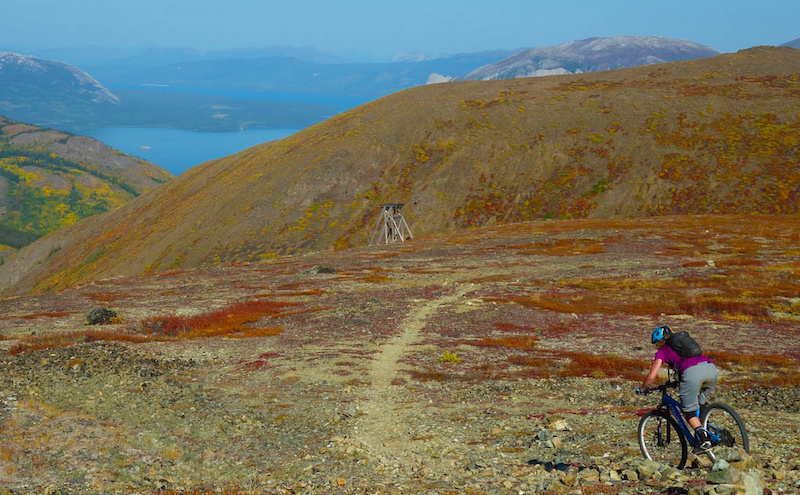 Carcross Yukon mountain biking – Summer 2017 from Lee Lau on Vimeo. 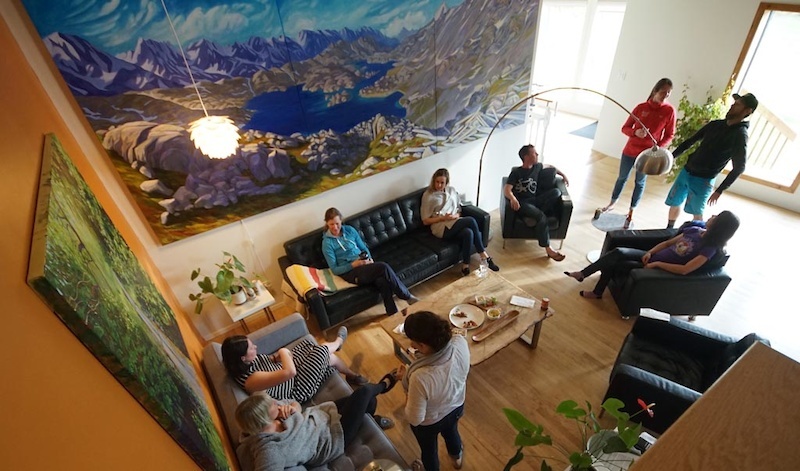 Carcross is primarily a First Nations community of 301 permanent residents, the majority of whom are from the Carcross Tagish First Nation (CTFN). 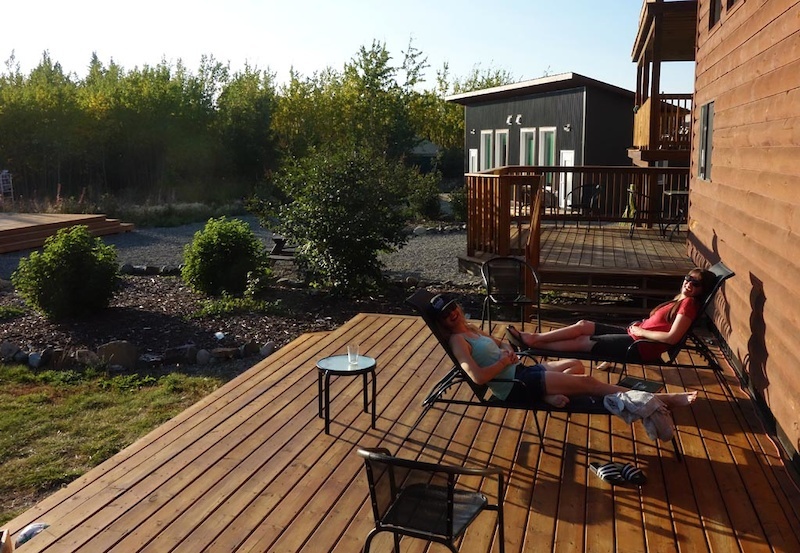 The main industry here is tourism, mostly from cruise ship traffic, the White Pass Railway, and outdoor enthusiasts drawn to area lakes, mountains, and more recently, the mountain bike trails. 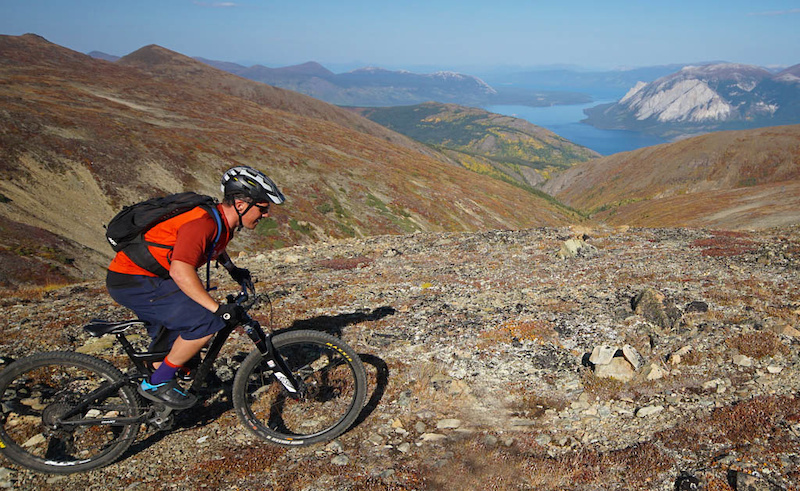 Neither Carcross nor Yukon Tourism track mountain-bike visitor counts, but anecdotal reports from 2013 estimated 3,500-4,000 mountain bike visits during the short 4-month tourist season. Those kinds of numbers can have a real impact on a town of just 300 people. Carcross and Bennett Lake in the morning. 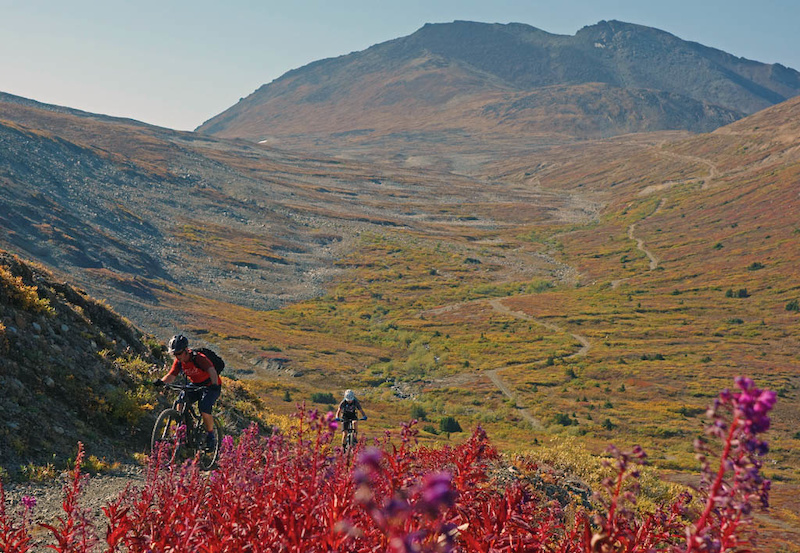 The Carcross trails have expanded over the years. 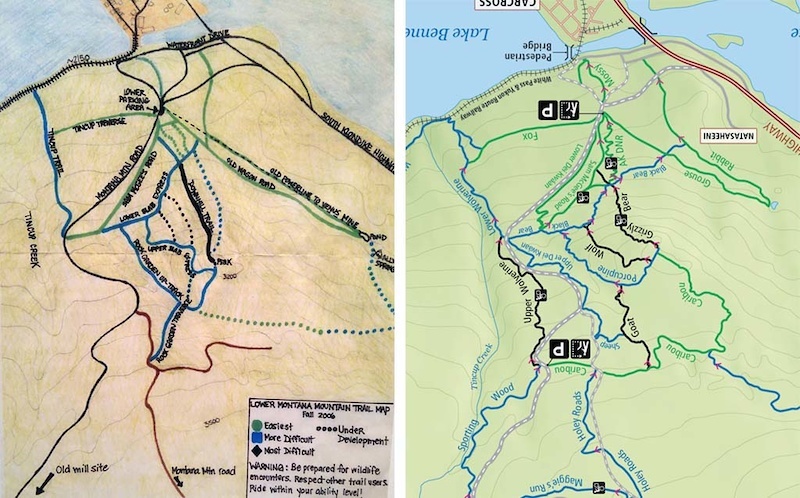 An old map from 2006 is shown on the left, with a more recent map on the right. 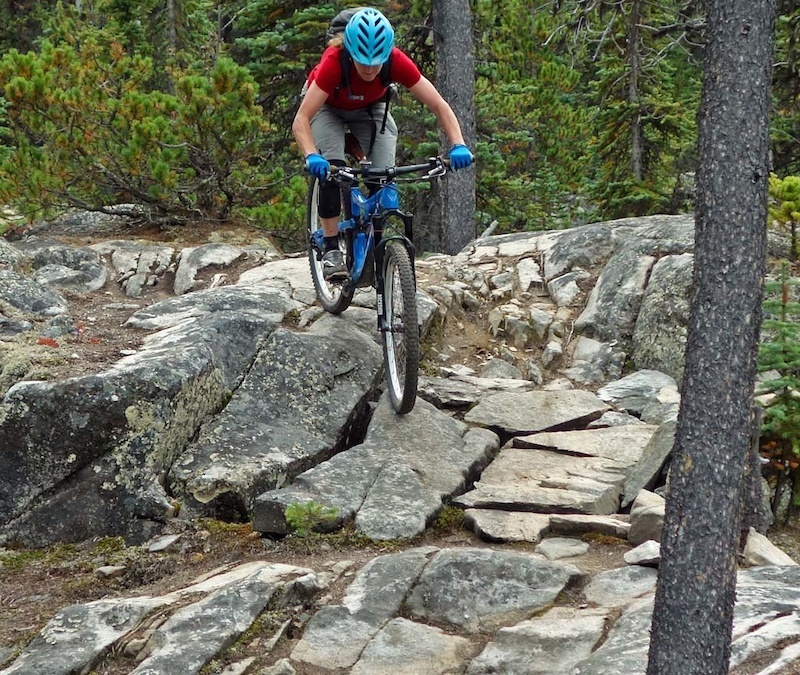 The Singletrack to Success (STS) program is a story both of the CTFN people and Jane Koepke. 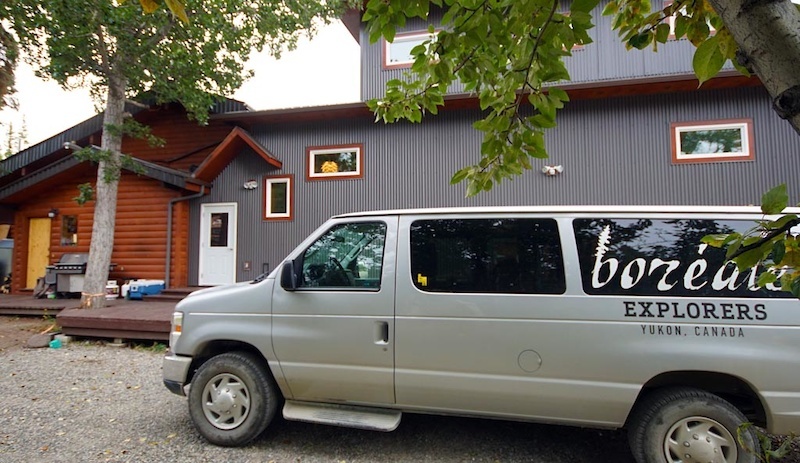 In 2004 Jane was both a government of Yukon contractor and a Whitehorse rogue trail builder. She had experience working with youth and, with Dave Gatensby, scouted trails on Montana Mountain out of personal interest. During these early days, the main trails were former mining roads and game trails. 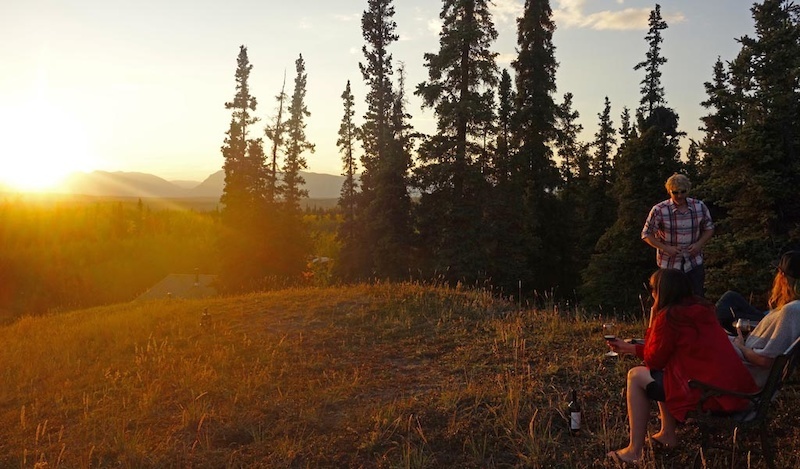 After gradually building trust with CTFN elders, and with younger people bugging their parents to let them build trails, Singletrack to Success was formalized as a not-for-profit in 2006. Jane, along with CTFN elder Edward Gordon, sold the concept of CTFN self-determination and opening their historical trading trails to the public. This coincided with the CTFN winning rights to self-government, a hard-won right that brought a responsibility for CTFN-driven economic programs. 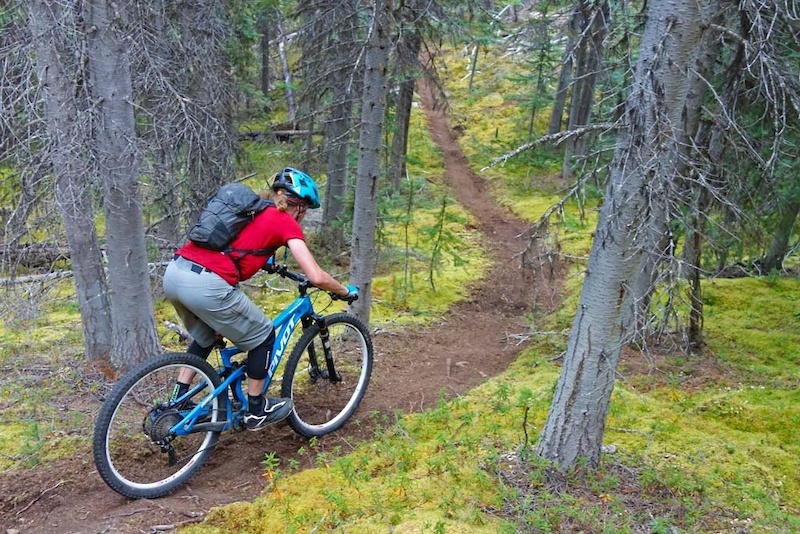 The CTFN bought into the STS concept, and a partnership developed where the local community and Whitehorse/Carcross-area residents cooperated toward developing trails as a community resource. Since then STS has evolved to include administrators, crew-leaders, and formalized trail crews. 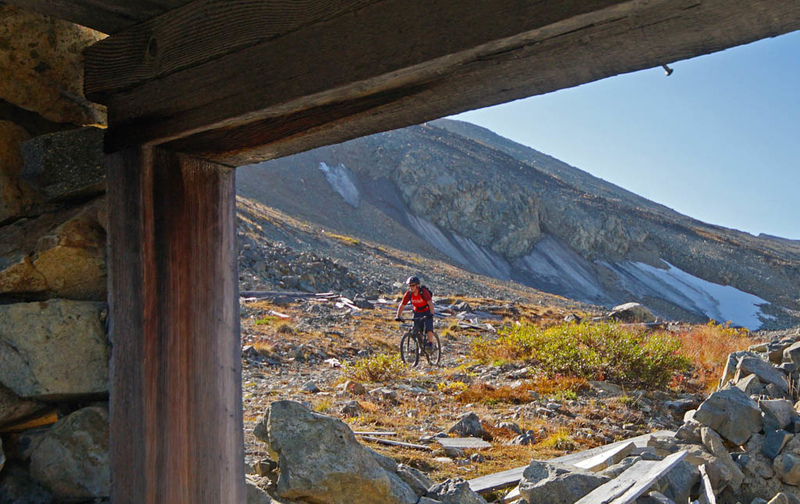 Over 35km of multiuse trails have been re-opened or built in Carcross since those first years. 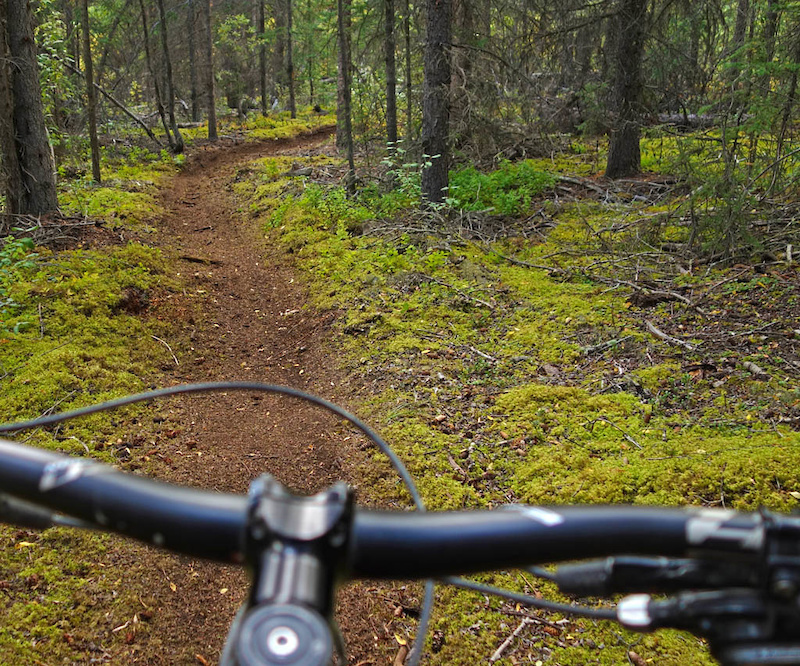 With that trail expansion, mountain bike visits have increased as the word continues to get out. 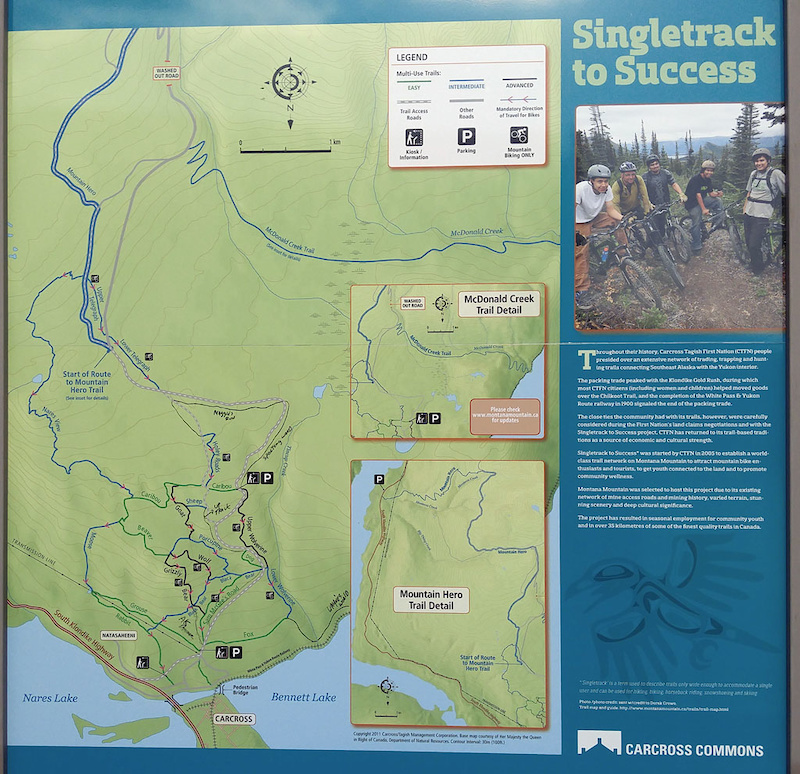 A sign showing the Montana Mountain area, with information about Singletrack to Success. Nares brown pow loamer. This trail is almost 7 years old. 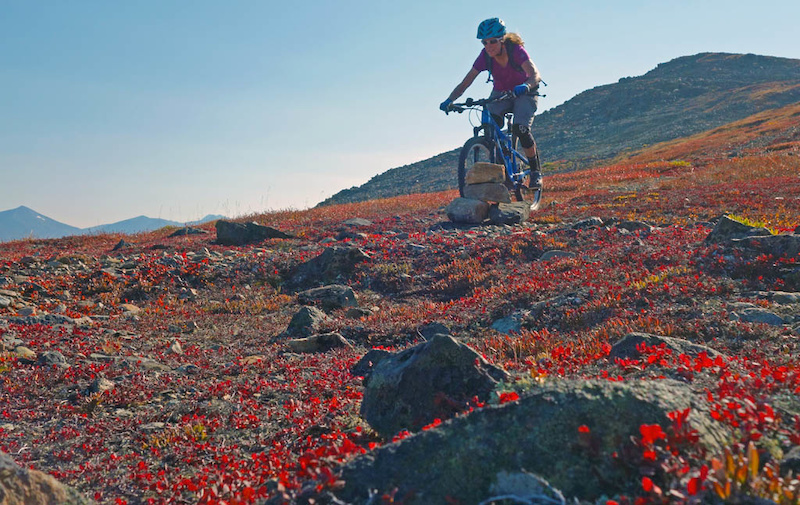 There are several route choices among the Lower Carcross trails, including alpine and subalpine trails accessible via Mountain Hero or MacDonald Creek. Many of the climbing trails are bi-directional. 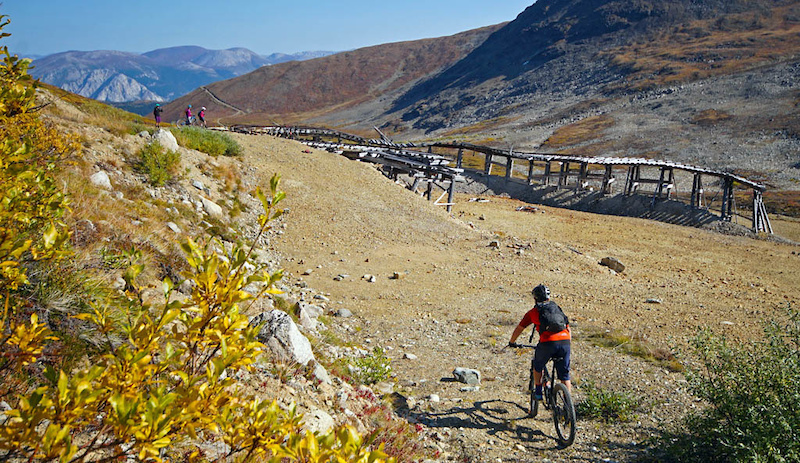 We rode Lower Carcross on a September weekday, so bike traffic was fairly minimal. 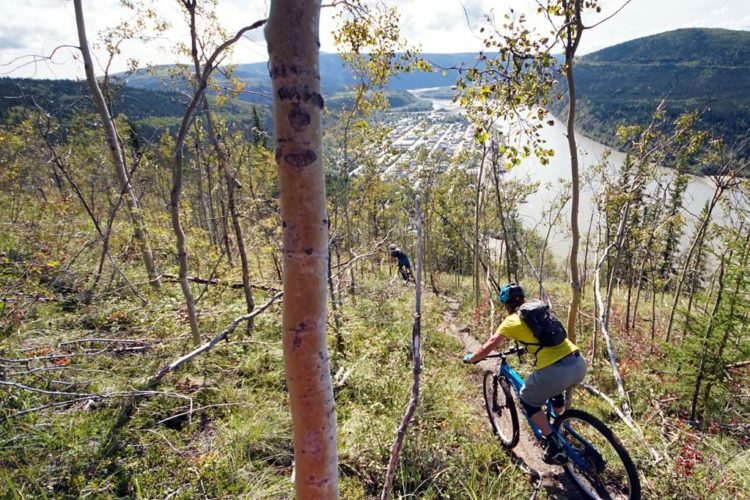 We found jumps and high-speed hits on the trails, some of which don’t have perfect sight lines, so it’s advisable to pay attention if climbing the trails at Carcross on a busy day. 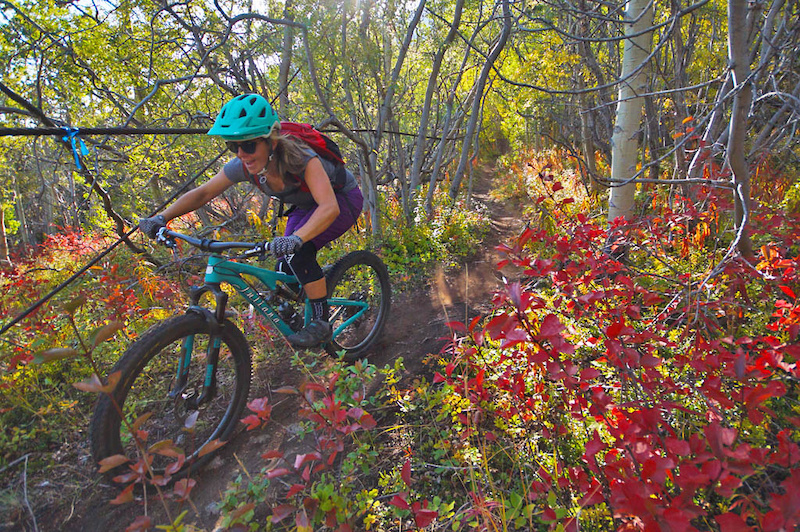 As always, uphill riders have the right of way… but watch for incoming descenders. 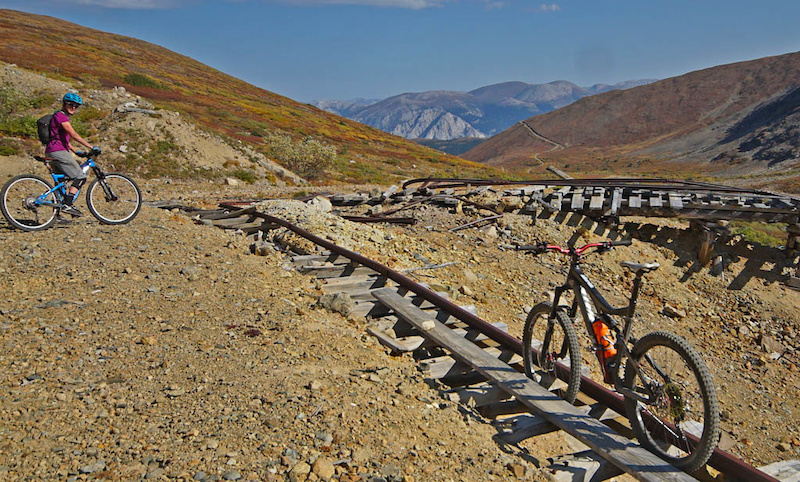 The Carcross trails generally ride well in all conditions. 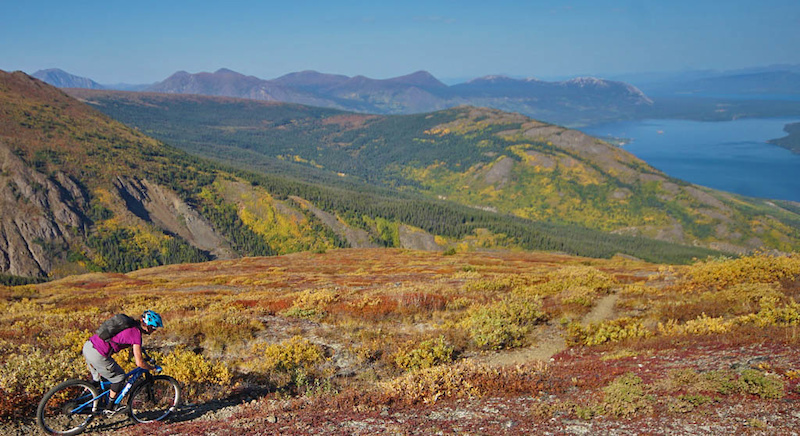 Wind carries “loess” from the St. Elias Range and Kluane Icefields, which is deposited over Montana Mountain and the Carcross area. In fact, this is how the “Carcross Desert,” known as the smallest desert in the world, was formed. 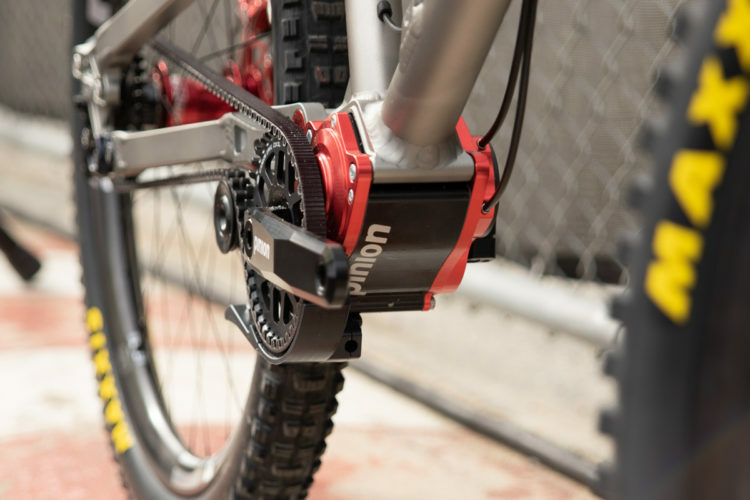 Fortunately for riders, loess compacts into a fantastically tacky, grippy riding surface. 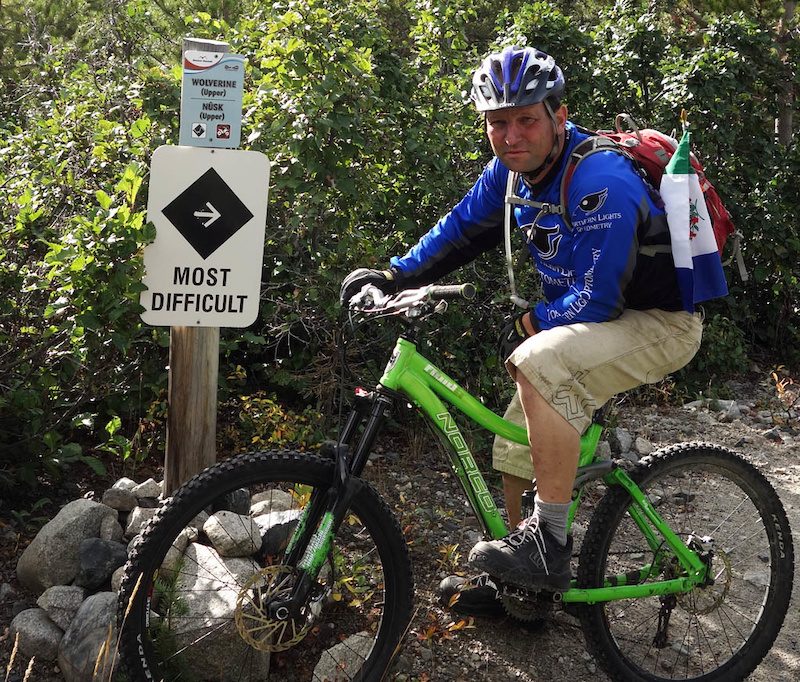 However, the trails don’t ride very well when they are saturated, so it’s a good idea to check Montana Mountain trail conditions before riding. Don’t do burnouts through town and roost up the gravel roads in front of residents’ houses. Don’t have huge drinking parties or burn native wildlife in parking lot campfires. 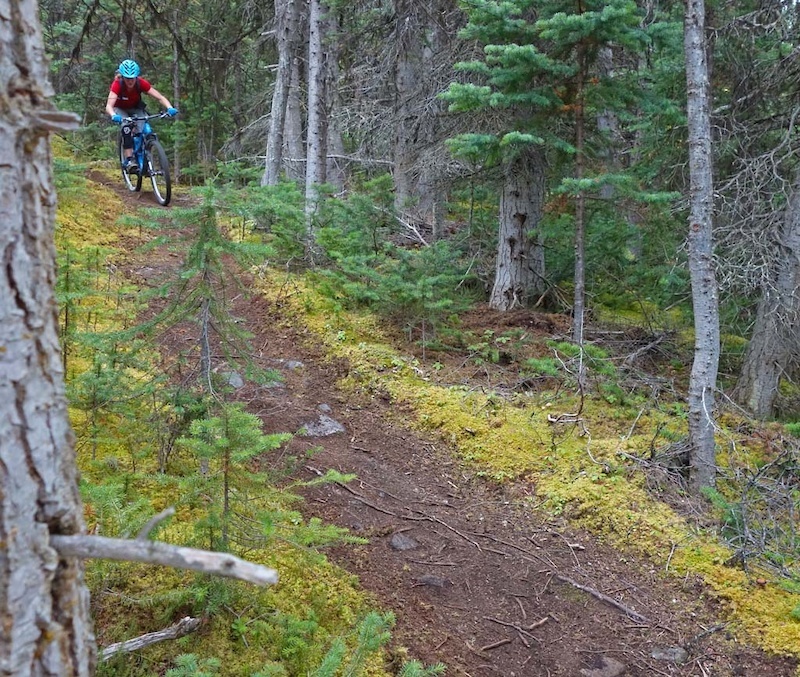 Restrain the urge to create gratuitous cutties and enduro lines through what was once mossy singletrack. Unfortunately all of these things have happened in Carcross recently. 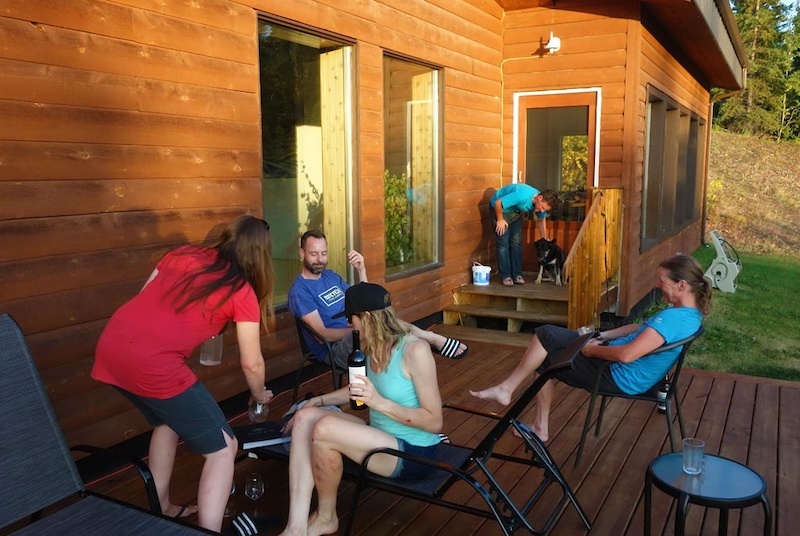 However, relations between mountain-bikers and the community are still good, so NOT doing these things will go a long way toward preserving that relationship. The trail network is well signed. The Goat trail: old school tech rock jank. 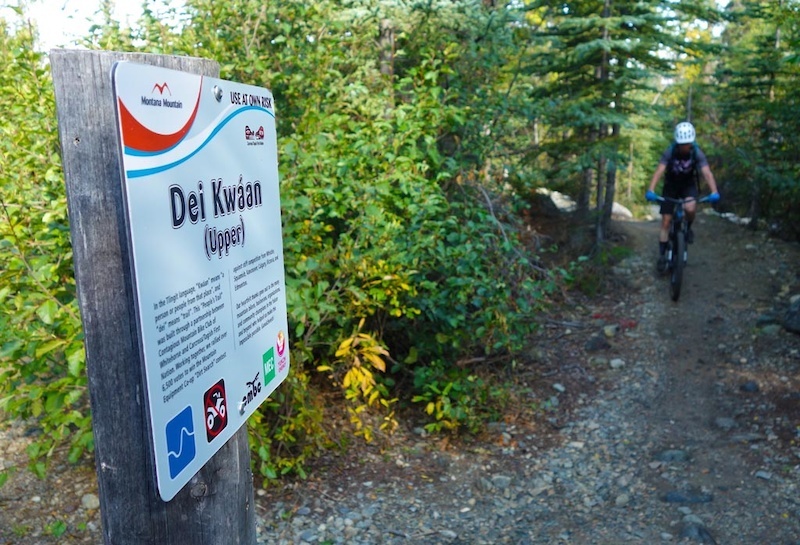 For our trip, we rode a 2-hour loop on the lower trails that climbs Dei Kwaan to Nares, to Goat and Grizzly, AK DNR, and back up to Sam McGee. 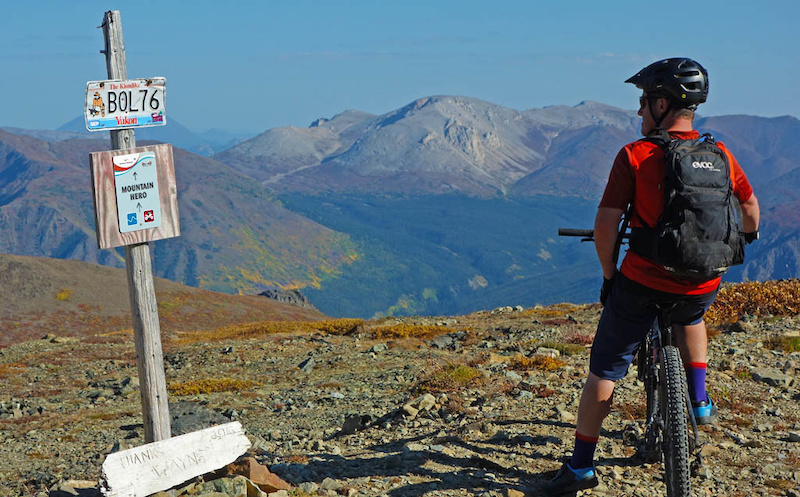 The Mountain Hero trail is a Carcross signature trail starting from the Yukon alpine and descending to Windy Arm in the valley. 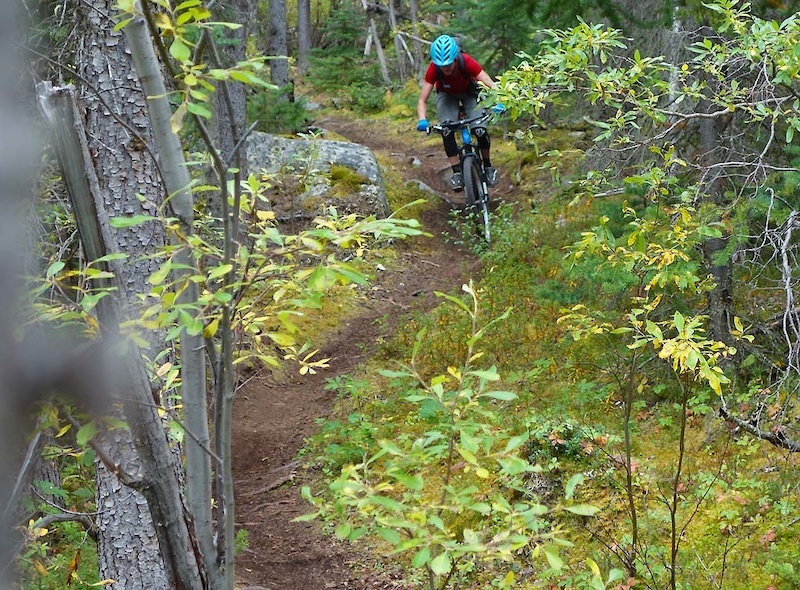 Much of the trail access is via old mining roads built to access the Mountain Hero Silver Mine. The trail ascends first through a boreale forest, then wispy low-lying, sub-alpine brush, then to the wind-swept, weather-beaten alpine. It’s incredible to think about the early century miners and how tough they were compared to us riding on our blinged out unobtanium bikes. 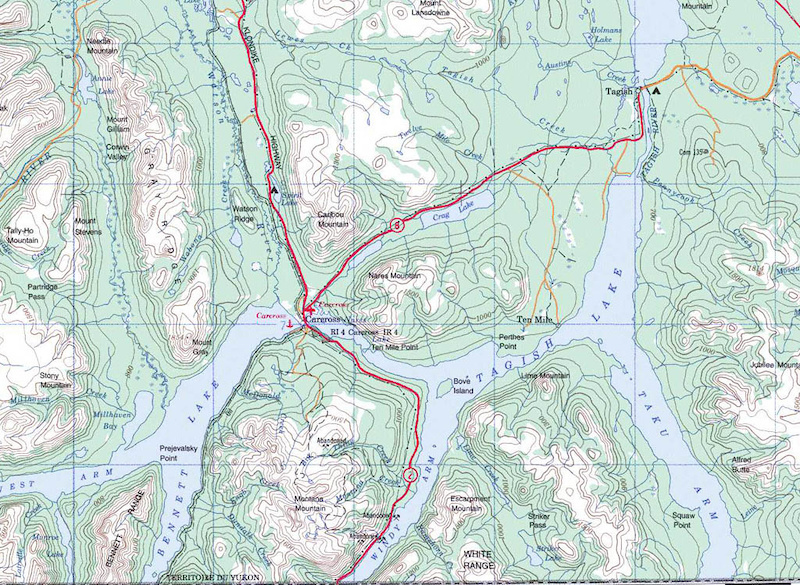 The CTFN traded extensively with coastal and interior peoples, establishing routes like the Chilkoot trail. Portions of the Mountain Hero trail were also used as an old trade route, and were resurrected by Wayne Roberts. Wayne was an 18-year Carcross local who moved to the Yukon from Prince George. Sadly Wayne left us too early in 2016. One of the original grumpy trail builders, Wayne came across an old tramway while hiking around Montana Mountain, and ignoring all government and bureaucratic processes, he built much of the Mountain Hero trail. 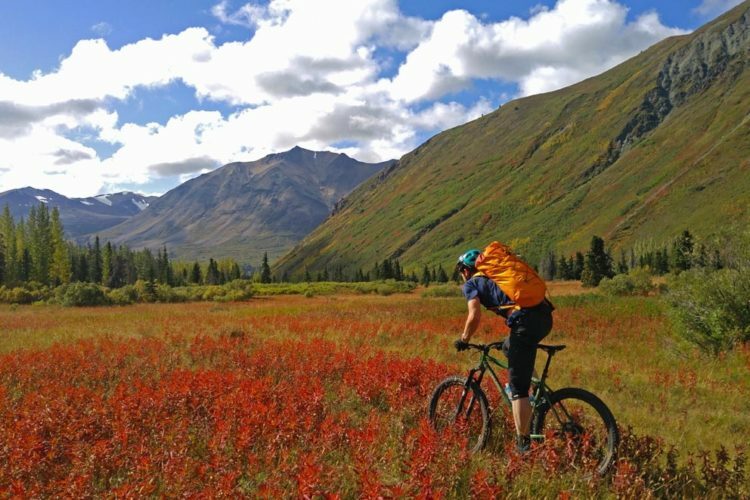 The Carcross trail network has expanded through the Singletrack to Success program and in that time, Mountain Hero endured. One local we all should thank for many trails on Montana Mountain and Mountain Hero in particular is Wayne Roberts, who passed away in 2016 after a long fight with Cancer. This is Wayne in 2013. Bennett Lake bridge. Wayne’s house is the yellow one at the base of the bridge. Sulphur Mountain and Brute Mountain are the twin peaks to the right. Montana Mountain can be seen higher up. We climb up via the lower trails. It is possible to get a Boreale shuttle to the upper parking lot. After about an hour we’re in the alpine enjoying the views. Bennett Lake is to the left and Caribou Mountain is to the right. 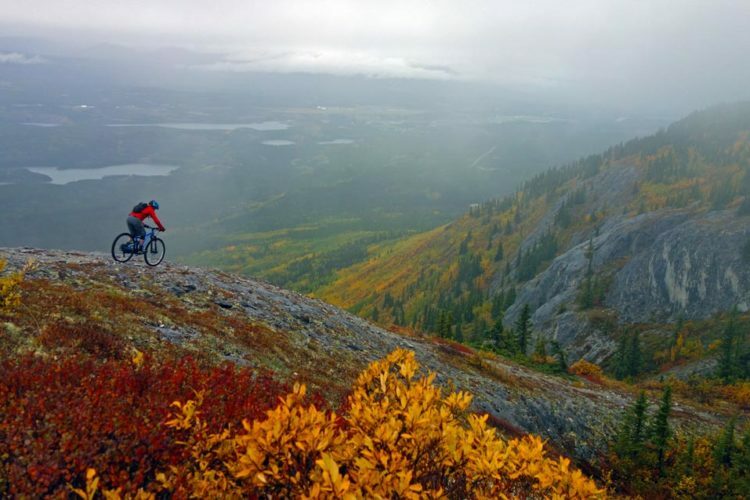 Mountain Hero is a 30km loop with 1,450m (4,800′) of climbing. It took us 6 hours to complete the loop at a moderate pace with chill time included. Warm winds, cloudless skies, and tacky trails were the story of the day. 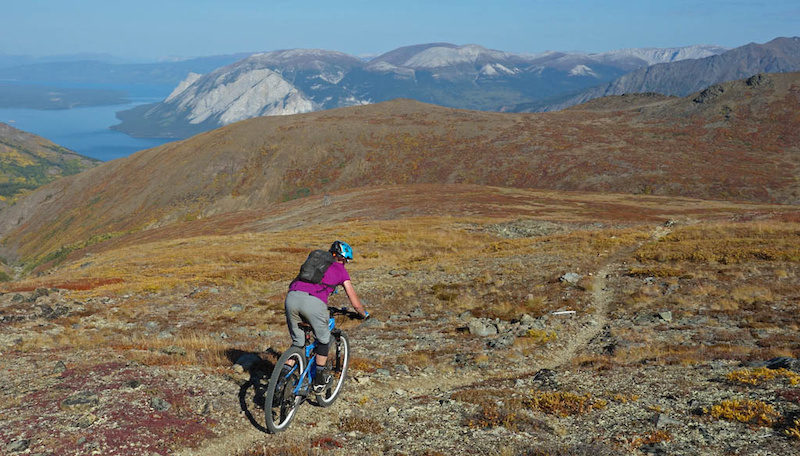 Riding Mountain Hero as a loop from Carcross adds a 10km road ride, but we wussed out and took a road shuttle. 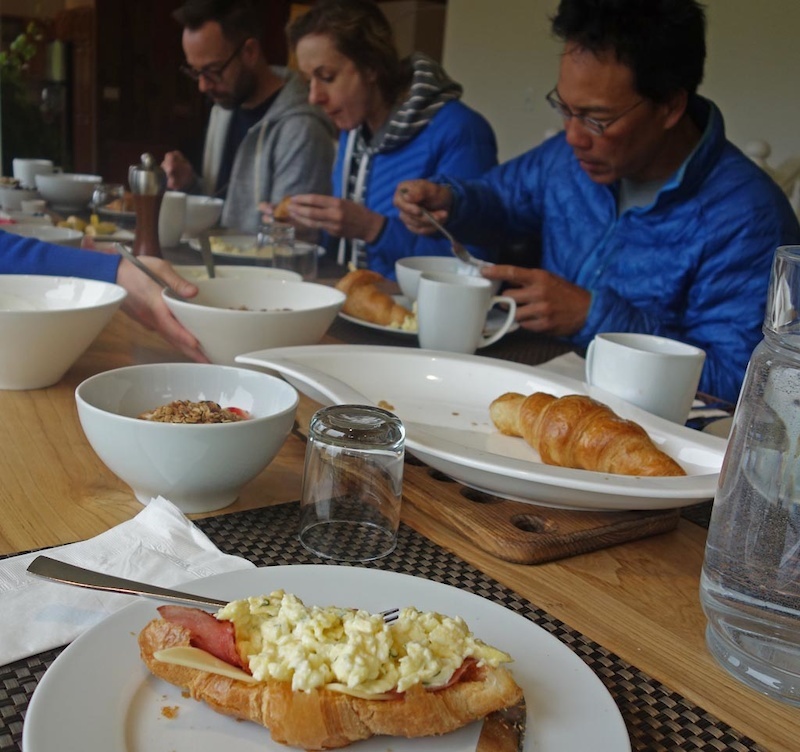 Riders can also add a hike-a-bike excursion to adjoining Sulphur or Brute Mountain, which adds another 1,000m of climbing. The opportunity to see views for miles and miles is unparalleled. View of Brute Mountain, the peak to the west of Montana Mountain. 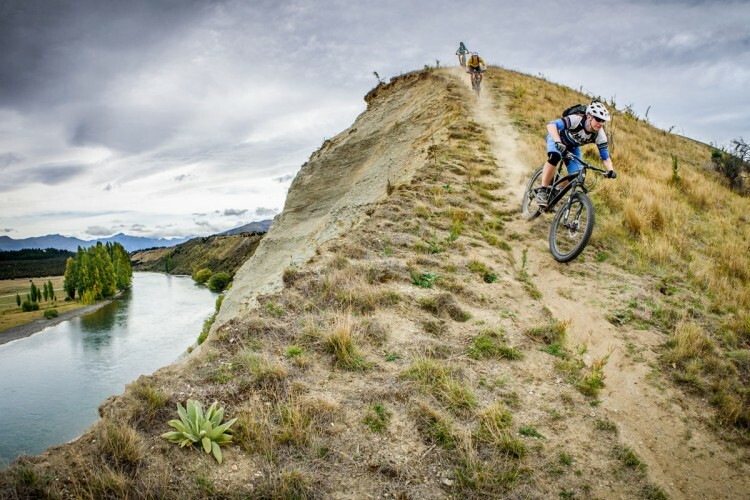 Riders can drop bikes at the Montana – Sulphur Col and scramble to Brute, adding another 1000 meters of vert to the day. 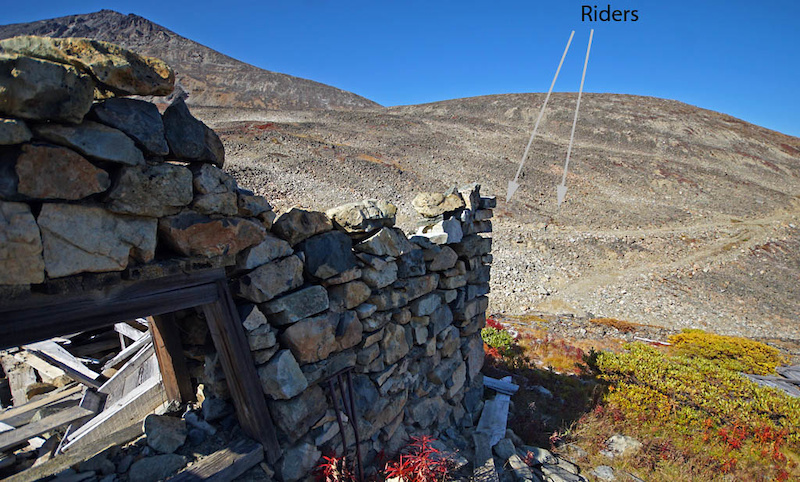 The silver mine located along the descent off the Montana – Sulphur col and the road ascending Montana Mountain. The road ascending Montana Mountain goes on for miles and miles, but makes for pretty fast travel. Consider turn-of-the century miners building this road with mules and handpicks. The mining road grind and traverse to the Mountain Hero trailhead can be windy and exposed to the elements. But we had amazing weather and views that went forever. 1,000m descent over 7.5km on scenic trails. That was acceptable! We stayed at the new and deluxe Boreale Ranch. 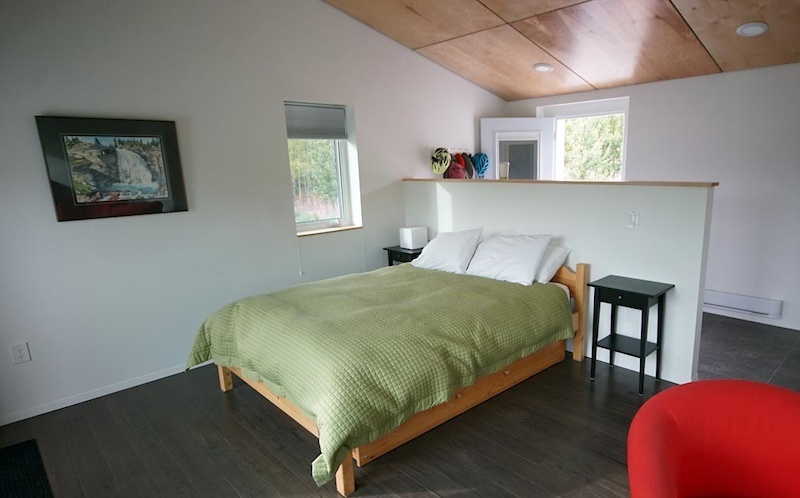 Marsha and Sylvain have created luxury guest accommodations between Carcross and Whitehorse in a quiet, serene, Yukon setting. 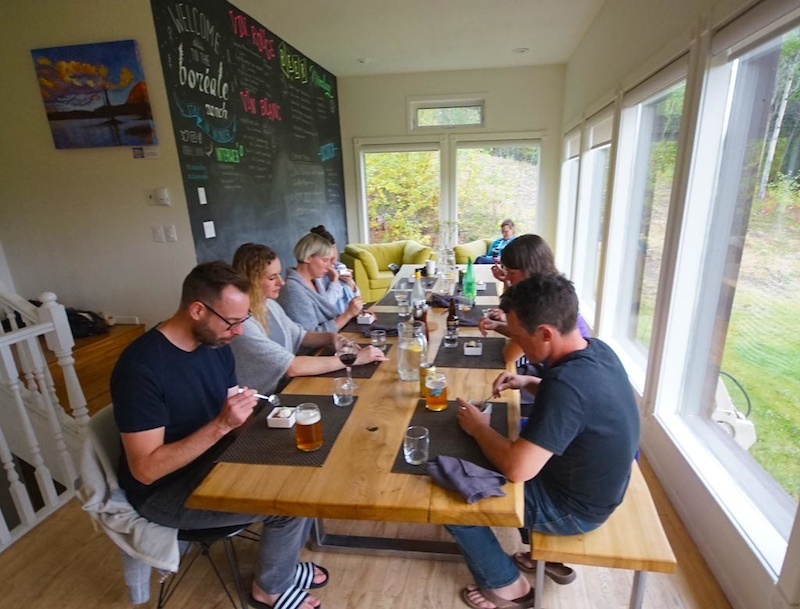 Boreale has private rooms off the main house as well as comfortable common areas for relaxing, eating, and drinking. 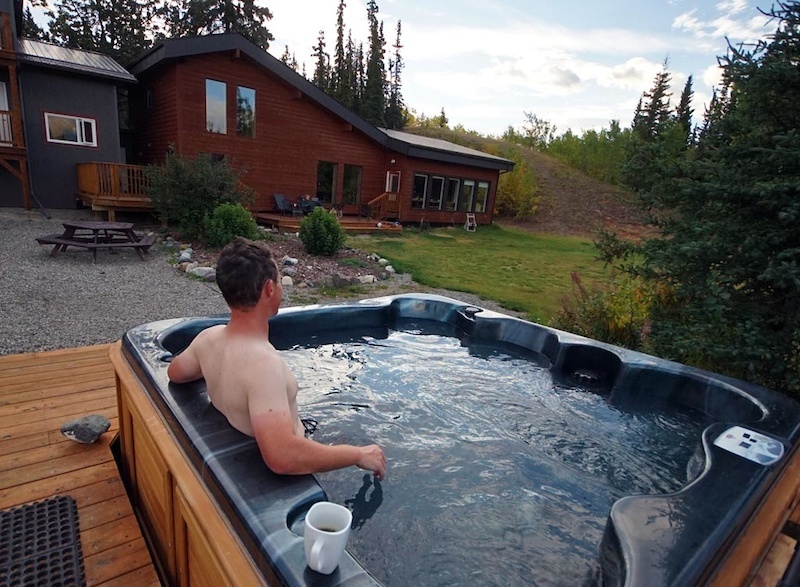 And they also have an outdoor hot tub! 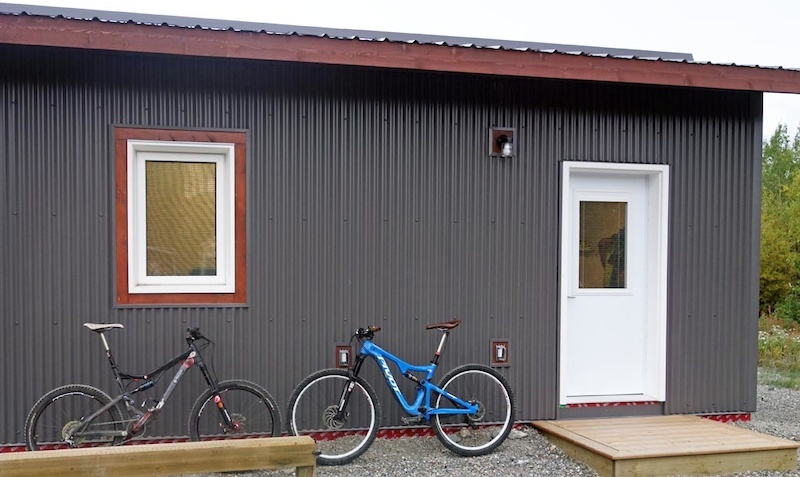 This place is very popular not just with mountain bikers, but also with people who want to view the Aurora Borealis. 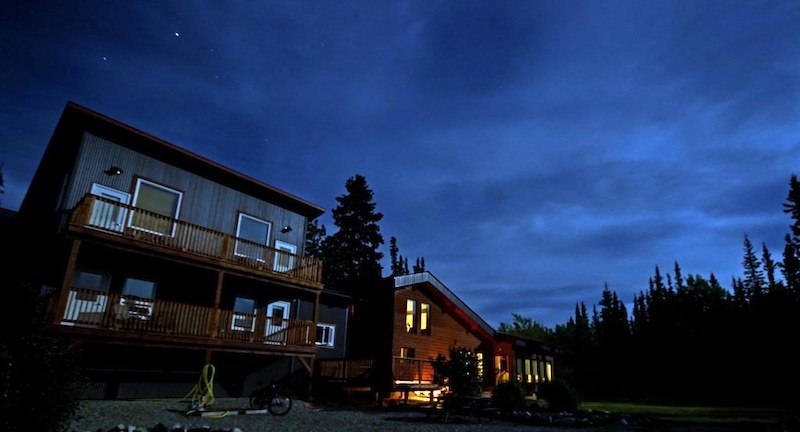 Boreale Ranch is located in a very remote, dark area so the lights shine brightly here. 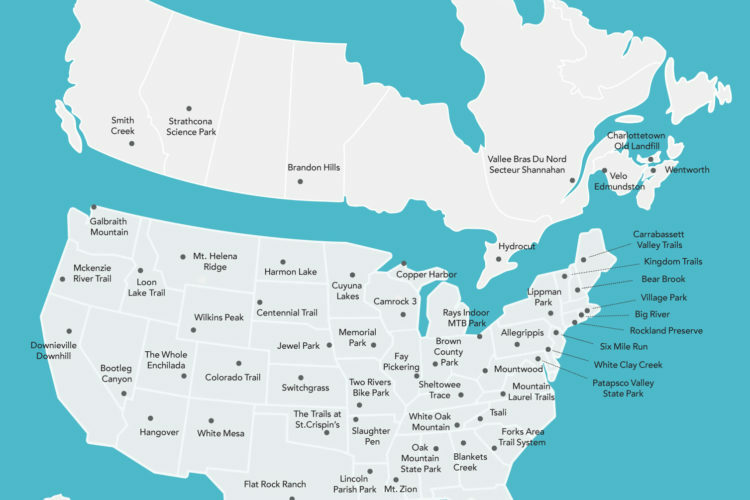 There is also a short trail around their property for walking, biking, or snowshoeing. 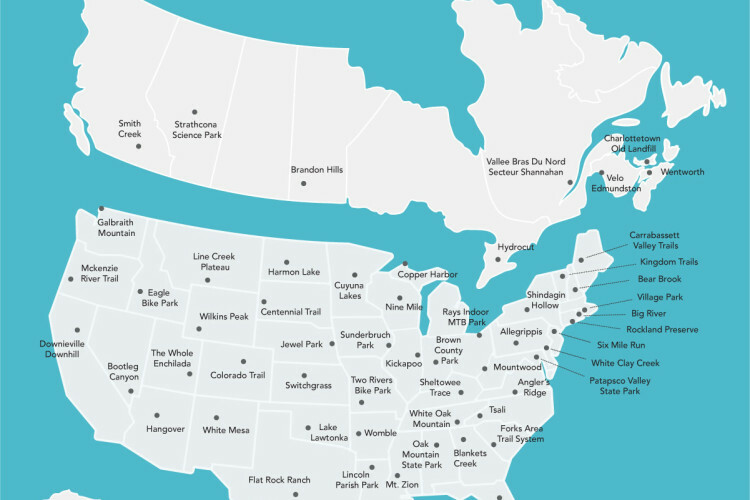 Adventure packages are available for both summer and winter. 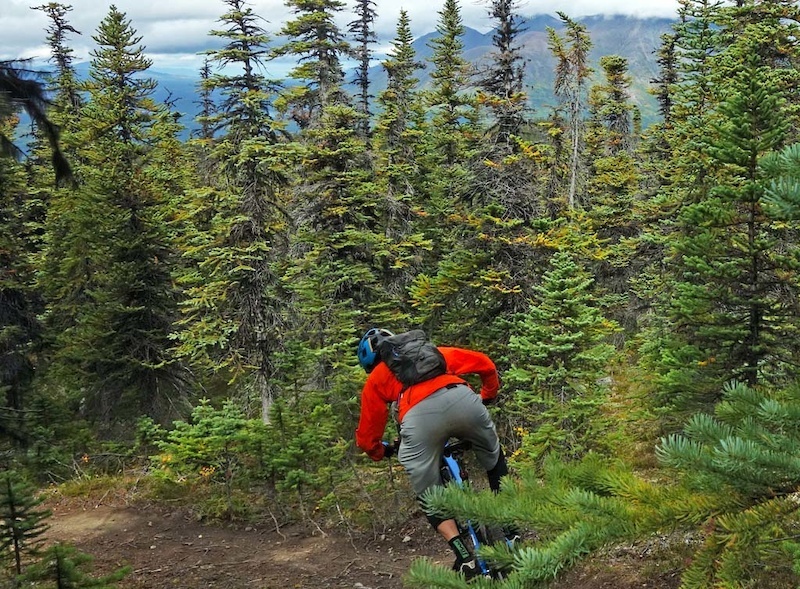 This is the final part in a series about mountain biking in the Yukon. Go back and catch up with Part 1, Part 2, and Part 3.